We certainly live in interesting times… | It's Up 2 Us! Yup, I admit it, I found myself cheering Clive Palmer at the National Press Club. And I even cheered Senator Ricky Muir (Senator?) of the motoring enthusiasts party. Despite the cognitive dissonance this is all causing, it is worth examining what’s happening and to look at how we can respond as activists and folks wanting to secure a ‘safe climate future’. 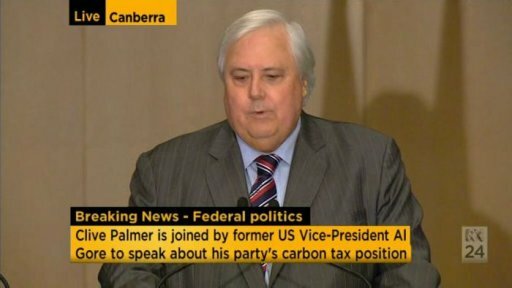 Much has been said and will be said about Al Gore’s appearance with Clive Palmer and Batman (you didn’t see Batman in there? look again). I want to look at where to from here. Whilst it’s absolutely sane to be sceptical over the statements being made by Clive and his team it does signal an incredible turning point in the debate. We’re not talking about whether Climate Change is happening but what we can do about it. Now, not sufficiently and we’re still not talking about what it will take to return to a safe climate but the conversation has changed and it’s well worth acknowledging the shift. What now for us? We must continue to be on the front foot, if you didn’t see 4 Corners on Monday night I recommend you watch it. It’s incredibly important that we believe, communicate and act as if we can turn this around – and I do believe we can. Australia is in a bubble right now, and it’s not a reality shared by other countries (check out Lord Debden from the UK Committee on Climate Change last night on Lateline). Yes we can point to the work of the fossil fuel industry as it continues to interfere with and delay significant action. As a recent campaigner said in training I attended “they are beginning to smell their own decay and are going to fight hard, possibly harder than we’ve seen before”. This fight is going to be dangerous for many (Peru have given their military and police the sanction to kill environmentalists) and tough for those of us who care. What’s inevitable however is the fossil fuel industry’s decline. A low carbon future is inevitable, the question is will it come soon enough?